Looking for God's Hand in the Bible. It's been a long time since I've been back to this website...but not as long as it's been between spiritual drinks. Yes, I go to church on [most] Sundays. Yes, I still call myself a Christian -- though my heart has been hardening over time. Yes, I read Scriptures posted on Facebook - and, sometimes, I read online Christian articles and listen to sermons on Youtube -- but rarely do I pick up my Bible. And, yes, I still believe in The Father, The Son and The Holy Spirit...even though I have drawn back from Them. But it's time to come back. Recently, I've confessed my sins, walked away from them, and asked that God would renew my heart in order for me to find my love for Him and His word again. I've asked that He would draw me near to His heart and, in opening my heart, enable He and I to be intimate -- as we once were. And He has answered yes. I feel it in my heart. I KNOW it in my heart. In making like the Prodigal Son and returning to The Father, I '...would gladly have filled [my] stomach with the pods that the swine ate, and (have) no one (give) [me] anything...' but, like the father in the story of the Prodigal Son, God wouldn't have it that way. Rather, He would rejoice over my returning to Him and, with merry heart, open His arms and His kingdom to me, once more. In celebrating my return, God has offered me, once again, His kingdom, my place in it, and all that He has designed, created, and wanted for me. In returning, and desiring to return to where I once was in His presence, starting with picking up my Bible, God has invited me to look for His hand in His word. In the following pages of this section, I am not aiming to teach anyone anything, rather, I am here to learn, to understand God better, and to know Him more intimately. I will record personal thoughts and what enters my heart, but, again, I'm not here to teach anyone anything. I'm just a girl looking for her Daddy's hand. Before leaving this page and going on to the blogs that will follow, it must be noted that I am not reading Genesis through to Revelation, from cover to cover, as one would normally read a book. Rather, as I read the Old Testament, I will also be reading the New Testament. (Confused yet? ;) ) ...Both books at the same time, 3 chapters at a time. For example, I will read Genesis 1-3, and then Matthew 1-3, then Genesis 4-6 and Matthew 4-6, and so on. This will allow me to do a couple of things that I deem highly important: 1. I will be able to look at the OT through Jesus' eyes and knowledge, which is found in the NT, knowing that He is God's heart in the flesh, and, 2. I will be able to read the NT three times while reading the OT once. My heart is calling for me to read it this way. I think, as followers of Christ, it's imperative that we understand the Old Testament through Jesus, rather than the other way around. 7 rooted and built up in him, strengthened in the faith as you were taught, and overflowing with thankfulness. 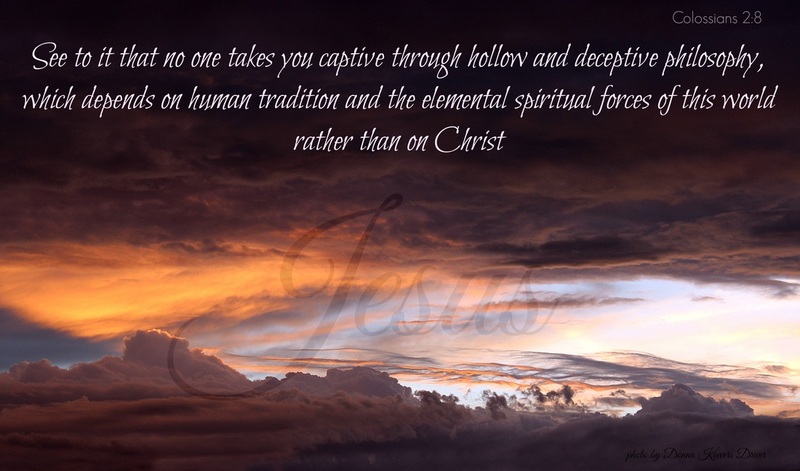 which depends on human tradition and the elemental spiritual forces of this world rather than on Christ. 10 and in Christ you have been brought to fullness. He is the head over every power and authority.